The French did not invented the torpedo boat, which was, for all purposes, merely a British crossed invention. Robert Whitehead indeed invented the modern torpedo concept in 1866, later refined by French and German innovations. John Thornycroft brings the turbine with her Turbinia in 1894, which really gave the impetus for modern TBs. Prior to that, improved TE engines did the job. What really gave the French the impetus to develop TBs (by 1880, the second world’s largest fleet and most serious rival of the Royal Navy) was the “young school” (“Jeune Ecole”) doctrine. In order to compensate the gap, a strong coastal defensive force was to bring some balance before main guns were to be shown. 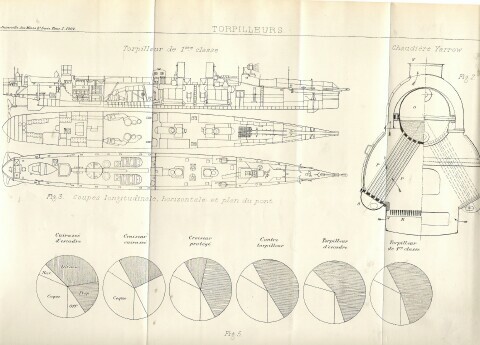 France experimented with torpedo-spar vessels in the 1860s already, an trials in 1875 ended with propositions for fast crafts, either sea-going vessels for the North Sea, and smaller vessels for harbor defense. For that purpose, one TB was ordered from yarrow and two from Thornycroft, on French specs. Tests and trials however ended inconclusively. Thornycroft TBs however, after a pause of 10 years were eventually ordered, twelve ships, followed by invitation to French yards to submit their own designs. Three, eventually, were so and the design was called 27 metres (88 feets). Production started in 1879, with a standard and an improved 27 metres design. Aside, there was also a small group of “torpilleurs-vedettes” (micro-TBs) specific for the use of the Foudre TB carrier, another spawn from the Young School. Normand shipyards then gained considerable credit for their design, and sizeable exports too. However, if its attempt at a 33 metres design was a success, the Young School pretty much resisted any real upgrade in size. The resulting 35 metres of 1885-90 were much the choice of Admiral Aube, another firm believer in the Young School thoughts, and this prolific class was anything but successful, noticeable compared to foreign designs, that had almost twice the range and a much better armament. After 1886 these were known as the “torpilleurs de défense mobile”, a byword for coastal TBs, of no use for high seas operations. meanwhile, Normand prepared the highly successful 126 class that was to be the next French standard. Although still light, this type had better capabilities and was produced in droves until 1908. Sea-going models studies started in 1884, the Balny class being the first (still small), followed by Ouragan class, also barely fit for “high seas”. Prototypes were then submitted by Thornycroft, Normand and La Seyne, on the same, enlarged design. At last, they were really true sea-going models, despite struggling for long with delays caused by experimental watertube boilers problems. Another serie followed in 1891, trying to reach 27 knots. 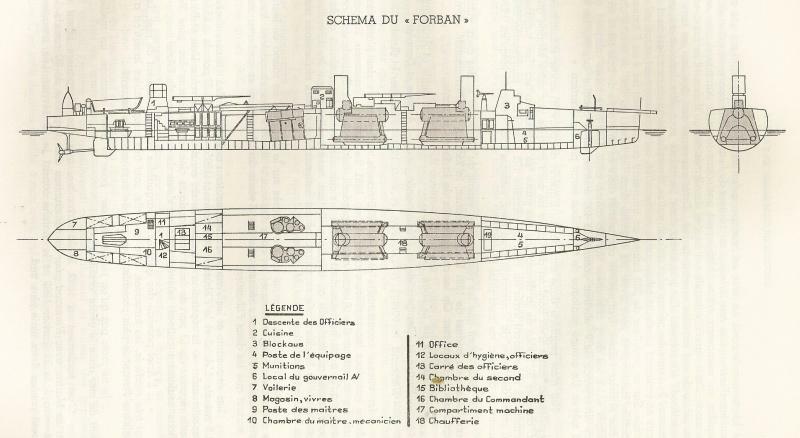 Normand’s Chevalier prototype was excellent, and improved later with the Forban (capable of 30 kts), the model for all subsequent large TBs, like the Mistral and Cyclone classes from 1898. However at that stage, they were outmatched by destroyers. It should be noticed that alongside TBs, the Young School insisted also on the use of coastal battleships, torpedo-cruisers and actively lobbied for submarines. 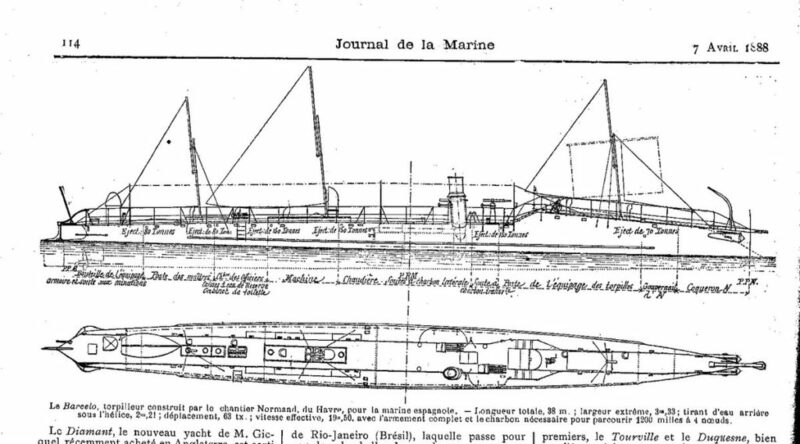 The first French TBs were in fact prototypes of various origin ordered for trials by the admiralty and numbered 1 to 7. There were two types, most of which were small TBs for harbor defense flotillas. No 1 was a Claparède design and the largest of all (102 tons, 38.61 m, 2 TTs). It was laid down on 29/05/1875 and commissioned in may 1876. 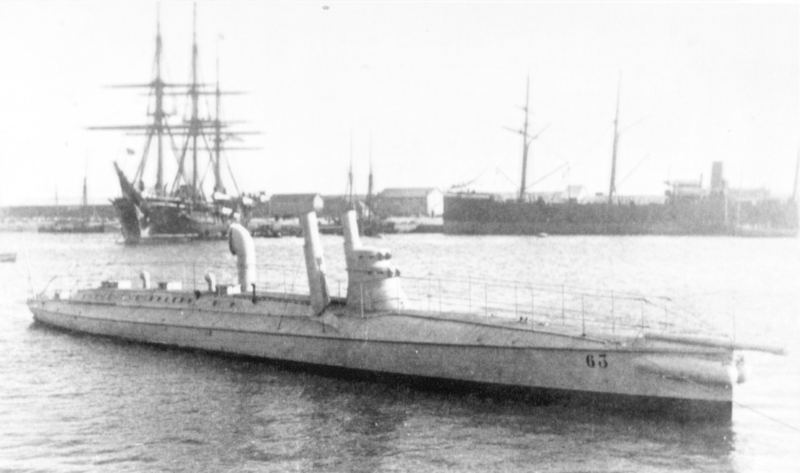 After some service it was affected to the defence of Cherbourg as aviso 3rd class, rearmed with a spar torpedo and two 47mm guns, and eventually stricken in 1889. No 2, 3 and 7 were French designs ordered from Rochefort, Claparède and Brest respectively. 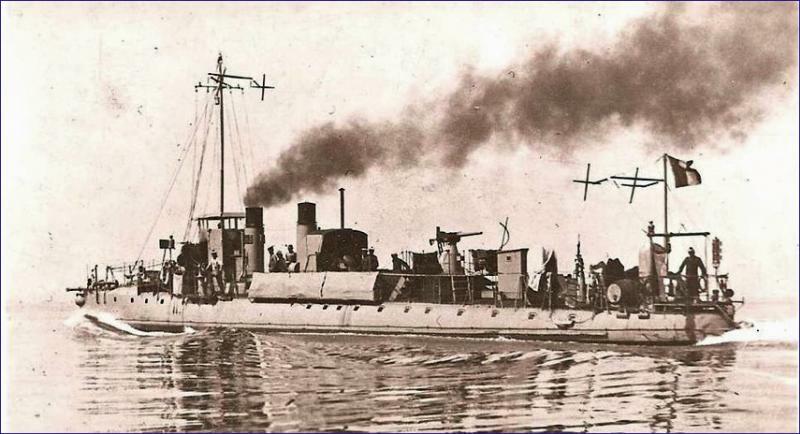 Fatum, an Italian 1888 armoured Torpedo Boat (the concept was later tried and sold to the Navy by Normand). They ranged from 22 to 31 tons, were 14.8 to 21.5 m in length, had a locomotive boiler coupled with one shaft, a top speed of 13-14 kts, and were armed with a spar torpedo, and a complement of 8. Accommodations were minimalist as their were intended only for local harbor defense flotillas. At last there were the British prototypes, No 4 from Yarrow and No 5 and 6 from Thornycroft. 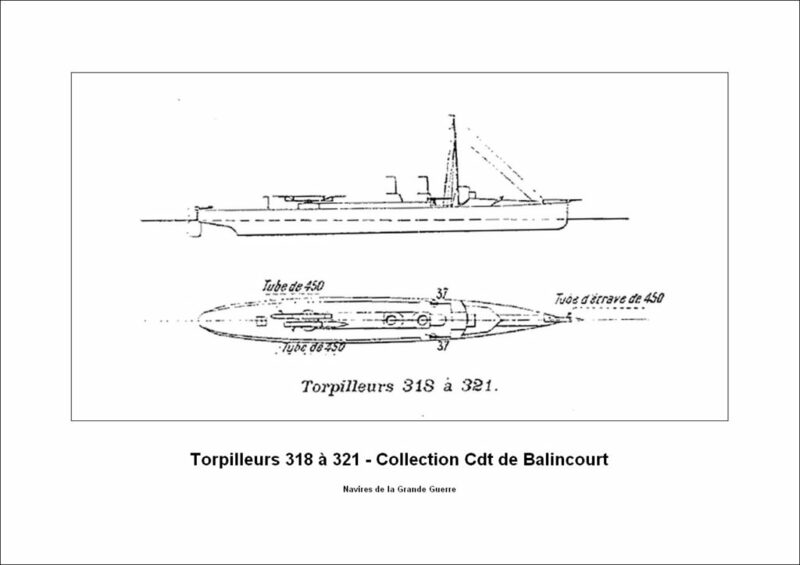 Still small (21, 22 m, 12-14 tons) they had or two spar torpedoes and the same complement of 8. The Thornycroft boats in particular gave excellent results and were kept for instruction and for the defense of Rochefort. These models motivated further orders, still from Thornycroft. These harbor defense TBs numbered No 8 to 19 were slightly heavier at 26 tons, longer and larger, with a more powerful locomotive engine (300 hp) providing a top speed of 18 knots. Armament was stilla single spar torpedo, of course no reloads. Orders started in March 1877, and they were all completed in 1878. They were generally seen as excellent sea boats and served for 15 years. 14 was reassigned as a tug, with a new boiler in 1894, 10 and 16 tested two Maupou TTs. The last of the serie had a new Trépardoux boiler, 2 TTs and two funnels. All were stricken until 1899. This prolific serie represented an attempt to copy the Thornycroft design by French yards, Normand (11), Claparède (9), and La Seyne (9). 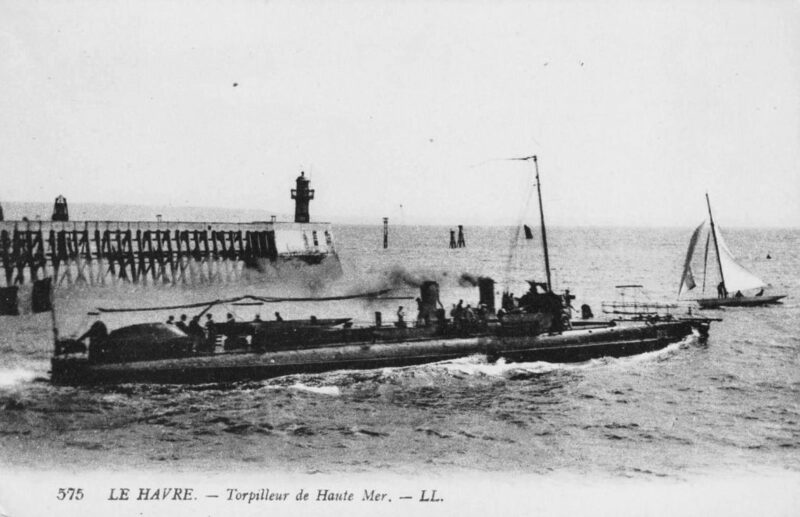 On average they were 30-32 tons, 26-27 m long, for 3.3-3.6 m wide, 1 spar torpedo or two TTs (Claparède boats).The Normand group were propelled by a shaft VCR, the two other groups 3 cyl. CR (compound reciprocating), engines with loco boilers. 320 to 500 ihp were produced, for 18 knots. By 1883 they were all redesignated 2nd class TBs and sold/stricken 1896-1908. Literally “Torpedo-boat launches” these had been one of the pet projects of the Young School for years. 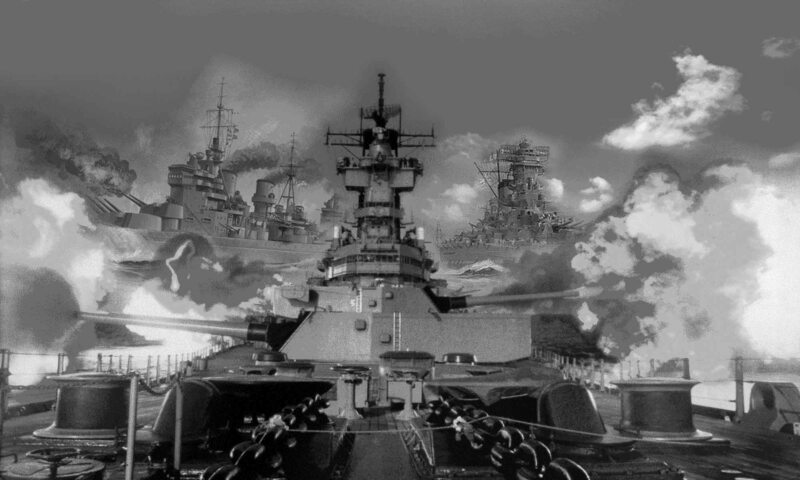 The idea was to carry and operate at sea a flotilla of TBs by a larger ship, providing a protection screen to the fleet. This process started with a study by the Commission on Underwater Defence, examining a Thornycroft 4-6 tons boat to be carrier aboard large navy ship such as cruisers and battleships, but eventually ruling out these as too small. Another pair of larger boats was ordered to Yarrow in 1878. Tests were performed onboard the converted transport Japon. These were not successful in 1881-86, and a purpose-built carrier cruiser was laid down for the task, called La Foudre. 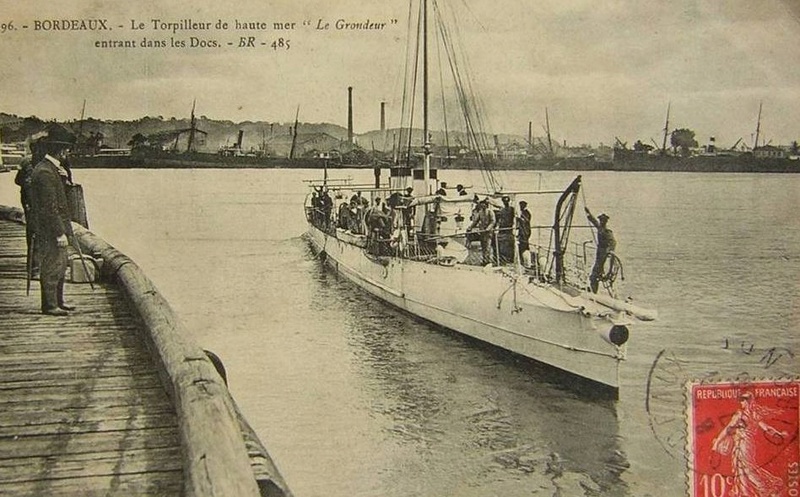 However La Foudre entered service in 1892, although it was able to carry properly 8 boats, the type was already obsolete. The 18 knots boats were judged too small for effective service due to rough seas. In total, 17 , of these boats had been built, in three groups. Thornycroft (6) in 1878-81 numbered 29, 30, 56, 57, 58, 59 and tested on Japon; Yarrow (2) 31 and 32 in 1879 (the largest at 27 tons, 27 metres, 2 TCs and later 2 Maupou TTs). The last serie (specs below) were numbered “A” to “I”, and of the Schneider type in 1894-98. They were reasonable seaboats, maneuverable, with a 100 nautic miles radius and were capable on trials of 17.5 knots. 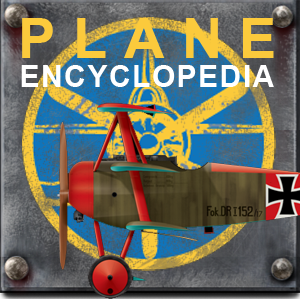 Soon after it was decided to drop the concept and convert La Foudre as a seaplane carrier, they were sent to the colonies, spending the rest of their carrier as Saigon’s harbor own defense flotilla, before being scrapped in 1908. These were three prototypes designated N0 26, 27 and 28 by La Seyne, Normand and Claparède respectively in 1878-79. These were attempts to design a sea-going boat with better characteristic of range and armament, and possible integration into a fleet. These three boats were 43-44 tons, had a complement of 11-12, a 2 or 3 cylinder VCR engine, 1 shaft, 1 loco boiler, 320/500 ihp, and a designated top speed of 18 knots. Armament was one single 343 mm (15 in) TT and two 37 mm revolver cannons. These 15 ships were built between 1882 and 1885 at Normand, based on the successful N°27. From N°65 to 74 these ships had a ram bow and modified armament of 14in torpedo tubes rather than 15in. The ram bow was considered in service as a failure as they create a visible wave, betraying the ships’s approach. The smaller caliber TTs were also required due to these modifications, and also proved difficult to manage. They had a rather large radius of actions, being economical steamers, reaching 850 nautical miles at 10 knots and being able to run 20, up to 21 knots when forced heated. The later serie was once required to be rebuilt as destroyers, but only N°68 was converted, with a new standard bow and four 37mm Hotchkiss revolver guns. None saw action in WW1 as they were all stricken by 1900. Although these types never fought in WW1, being stricken from 1900 onwards, they has been one of the most important and prolific class of French TBs prewar. 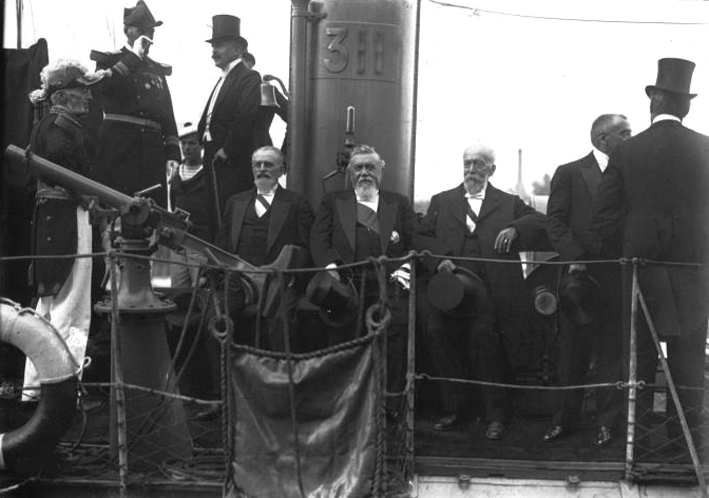 51 indeed has been delivered by various shipyards from 1887 to 1889, numbered 75 to 125. These yards were Chantiers de la loire (Nantes/Claparède), Cail (Paris), Schneider, La Seyne, Granville, and Gironde. They were based on the 33m design but longer, slightly larger (3.35 vs 3.28 m) but with a smaller draught (0.89 vs 1.10 m). The other big difference was their raised turtleback forecastle section for improved seaworthiness, second stern rudder in tandem, and new CR locomotive engine producing 525 hp (no better speed however because of the weight surplus). Armament in a way was reduced, two torpedoes less being carried. However they received in service two 37mm revolver guns. Introduction was slowed down because of the decision to change their boilers, without any speed benefit. In service they showed clear limitations, being unstable, rolling badly in bad weather. Despite sacrificing two torpedoes, in practice they rarely met their design speed of 20 knots. 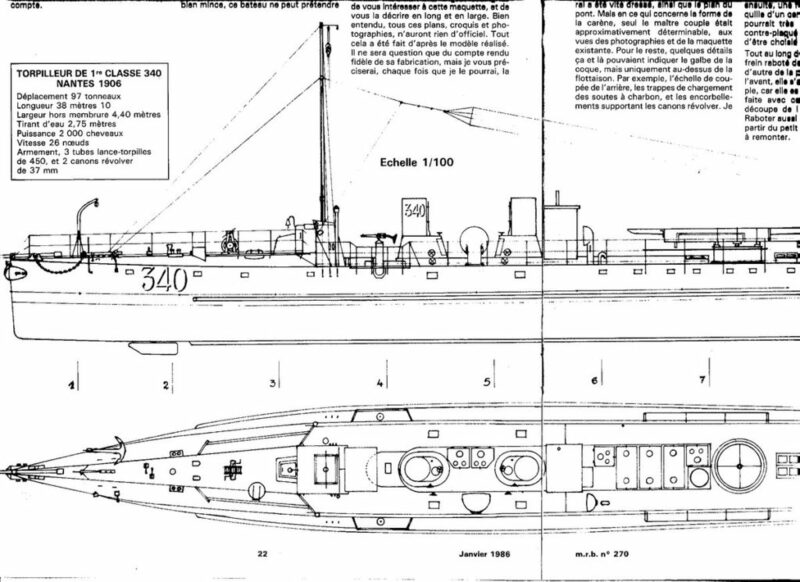 Normand was not involved in the 35 metre type design, being largely a navy design partly inspired by the 33 metre. Normand was very critical of it, and submitted their own type, unofficially named 36 metre. These were four ships built in 1889-1990 which had two trainable TTs in single mountings, two QF guns and a reworked hull which proved very stable. In addition they received a larger boiler and better engine, much more powerful, and were faster at 21 knots. They even received a light schooner rig. They has been extensively tested and used in maneuvers until stricken in 1908 and 1914, but inspire a brand new generation of “défense mobile” TBs. Impressed by the new Normand design, the Navy ordered a serie called the “34 metre” type, lighter than the former. They had been built by Normand but also Chantiers de la loire, 15 in all, the last being launched in 1892. They were many differences with the previous design but overall not a clear improvement but for the adoption for the first time of a vertical tube Du Temple boiler to fed a triple expansion engine. These made them economical steamers, good seaboats, but not faster despite their weight down to 52 tonnes. Armament was reduced to one spar torpedo, one trainable 15 in TT and two 37 mm revolver cannons. By 1910 all had been relegated to auxiliaries, and stricken before or during the war, only N°135 managing to survive until 1921. Not quite satisfied with the 34 meter, Normand submitted to the Navy her new improved N°126 type. 25 were built until 1893, at Normand, Chantiers de la Gironde, Granville/Le Havre, F&C de la mediterrannée, and Schenider, with engines made by Cail near Paris and various types of boilers, Normand, Oriole, Thornycroft, Dion-Bouton or Trépardoux. Basically they were repeats of the N°126, more powerful at 1000 hp and reaching 21 knots with ease, with one trainable TT in single mount and one fixed in the bow, plus two revolver guns. None saw action in WW1, only N°158 survived as an auxiliary boat. A second serie was started in 1892, 29 ships in total, with the same specs, although N°192 to 200 were one meter longer to accommodate larger boilers. The power was raised to 1350 ihp, but can reach up to 1700 ihp on trials with forced heating, for speeds ranging from 21 to above 22 knots depending of the builder, which provided its own boilers. 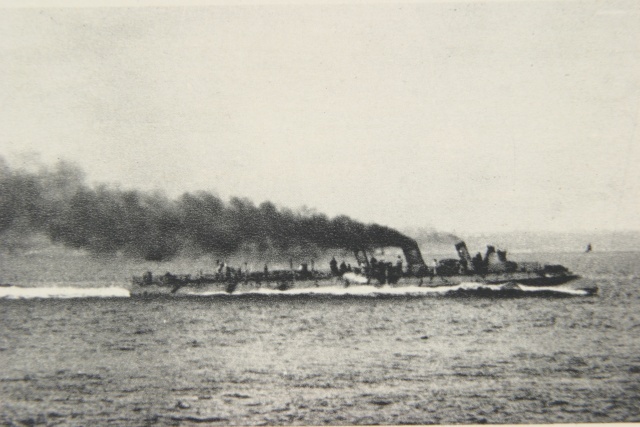 Navy design speed was 23 knots but most in practice stayed at 22 knots, with the exception of Normand boats (24 knots and more), N°191 reaching 25.38 knots. 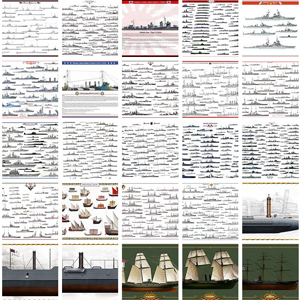 All these ships were stricken prior to WW1. This serie of no less than 92 ships was the most famous and prolific, providing the backbone of French coastal defence in WW1. They aso were influential and met export success. These were designed as larger versions of the previous Type 36 metre (never an official record only used there for simplification), being exactly 37 m long (121.6 in at the waterline). They were wider also at 4.20 m (13 feets 9 in) and with larger draught of 1.22 m (4 feets). These specifications changed a little according to local manufacturers. The serie was produced up to 1904. Most of the design work was aimed to providing more power with various engine and boiler configurations, Normand being ahead of this game, producing ships with 2000 ihp normal (more when forced heating) and reaching their design speed of 24 knots. Armament was the same as above, with a bow TT and a single trainable TT at the rear, and two centerline 37 mm QF revolver guns between the funnels, two because of their two boilers for the first time. Economical steamers their range was better. N°243 tested a Rateau turbine. In service, sixteen ships were shipped and stationed in Saigon and six at Diego-Suarez base in the Indian Ocean. Part of the ships were stricken before and during WW1, the others in 1919-23. Following the test of N°243, three other prototypes were built in 1904 (293, 294) and 1905 (Libellule). –The N°293 was a Normand design, 94 tonnes, 39.50m long (129 ft 8 in) fitted with three shaft Parson turbines fed by two watertube Normand Boilers producing 2000 ihp in all. 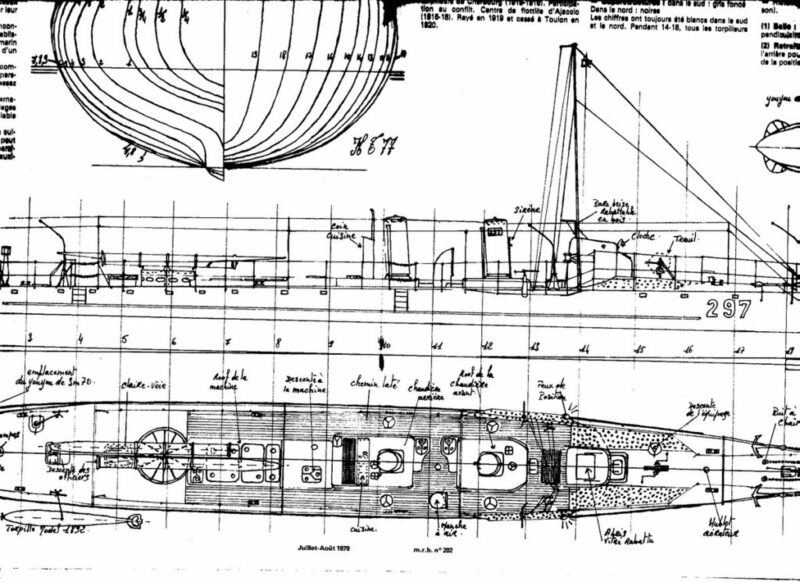 The hull was modified to accommodate the british turbines. She succeeded in making 27.3 knots in trials, reduced to 26 in service, but was plagued by a high fuel consumption which caused a limited range. She was stricken in 1910 but served until 1916 as a tender at Brest. –The N°294 was ordered from Bréguet (subcontracting to Chantiers de la Gironde), testing its own turbine design. These two Bréguet-Laval types were fed by two Du Temple vertical tubes boilers. She only reached 25.14 knots on trials, and had no cruising speed. range was even lower. She was stricken in 1910, but served as a tender in Brest until 1914. 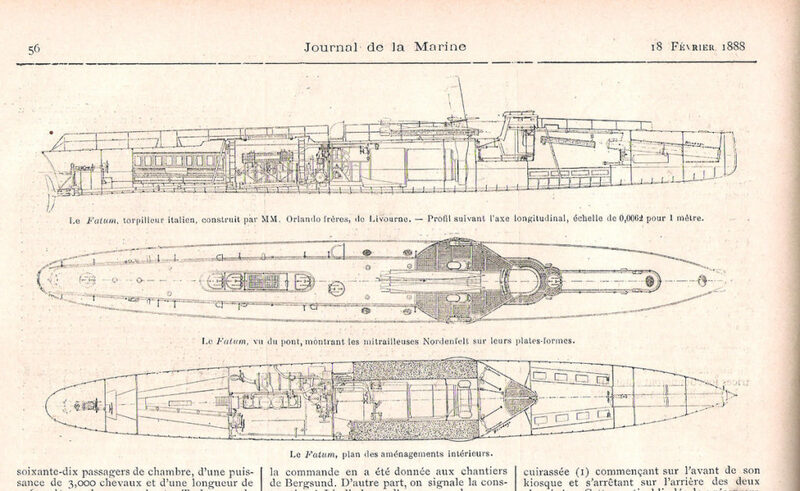 –The Libellule was quite a smaller ship, 39 tonnes, 36.40 m long (119 feets 6 in), ordered at the initiative of Emile Bertin in March 1898 and conceived as a new type of “torpilleur vedette” to experiment the Renard steam generator. To gain design time, the hull was a repeat of the 34 meter type, built at F&C de la Mediterranée. The delicate and complex renard system made the construction process subject to many revisions, so the prototype required six years of tuning. In service it proved capricious, and eventually very disappointing, the speed of 15.2 knots being the only one reachable. After trials Libellule was decommissioned and stricken in 1910. 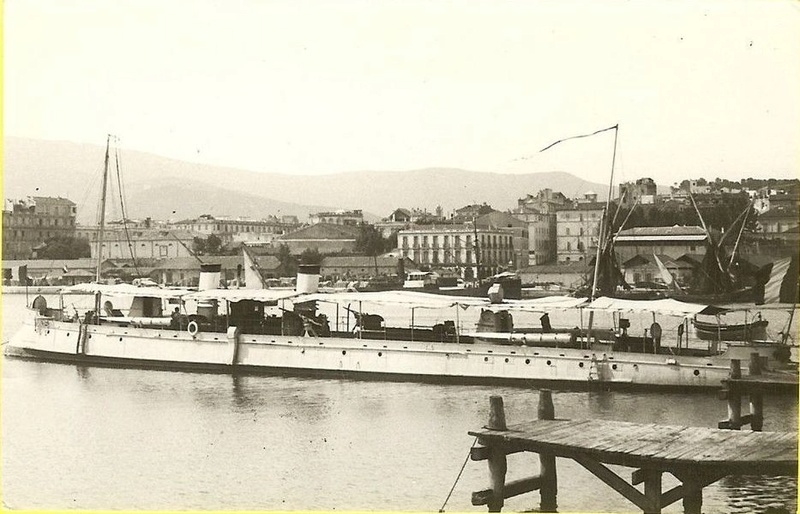 Large serie of seventy-five ships built in 1905-1908 by various yard for the “Défense Mobile”. They were slightly heavier and longer at 38 m (124 fts 9 in), larger by 20 cm, with a 1,88 m draught (6 ft 2in) but a conventional powerplant: 1 shaft VTE (Triple expansion) engine fed by two Normand or Du Temple boilers which produced 2000 ihp, procuring a top speed of 26 knots. In reality it was capped for some to 23 knots at sea. 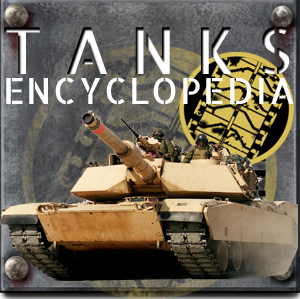 The major difference was the adoption of two trainable TTs on one single mount instead of one, placed head to tail, of greater caliber: 18 in, or 460 mm. However they retained their relatively light 37 mm/20 cal Hotchkiss guns Mle 1885 despite some criticism about their low velocity and very short range. Only three ships out of seventy-five were not fitted with engines and boilers designed by Normand. So these were fast and capable boats, and good steamers. The three experimental ships were N°366, 368 and 369, fitted respectively with Lentz engines, or Delaunay Belleville (next two) with forced lubrications and lower power (1800 ihp). The latter were more economical and had greater range, but at the expense of speed. They formed the backbone of WW1 French coastal TB force, but outside deployments in the Mediterranean, they saw little action, at least compared to their “great sisters”, the high seas TBs (see after). Below is the carrer of a late one, N°359. In fact they were used with little enthusiasm as by 1910 the Young School theories were considered obsolete, or more as the whole concept of défense mobile. They were seen at best as a backup last line of defence, almost a reserve but which trapped able sailors that would be more useful in more capable ships elsewhere. Losses were a few: 300, 317, 319 and 235 were sunk by mines and the rest soldiered on until the 1920s, some beyond in auxiliaries duties. These were the last french coastal TBs. After that, high seas TBs, experimented since the 1880s were preferred, giving birth eventually to proper destroyers. This is chapter 2 in this long post. -Hull entirely constructed of sheet metal and steel angles. -8 waterproof sections. 3 torpedo tubes, 450 mm model 1892. -1 Thirion service bilge pump with a capacity of 9000 liters/h. -7 steam ejectors of of 40 tx/h, 2x20tx/h capacity. -1 80 V steam dynamo. Built by Société des Chantiers de Normandie, Haute-Normandie, 76, Grand-Quevilly. 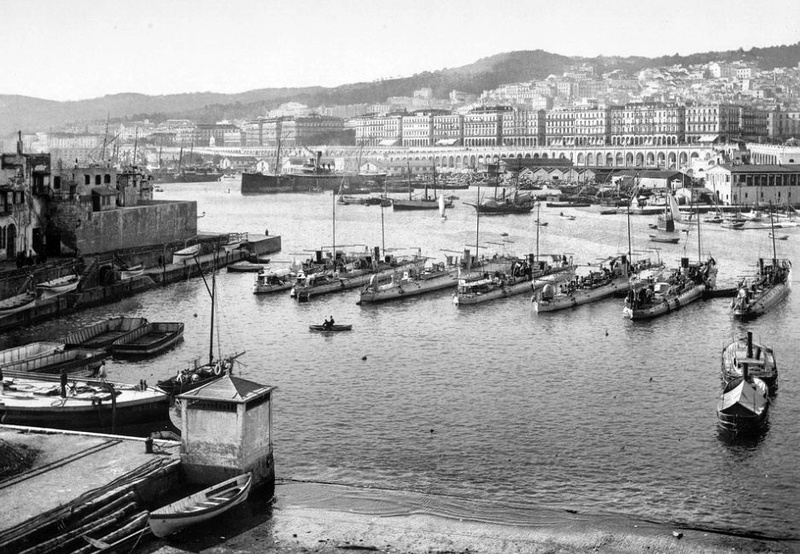 fleet of the Mediterranean torpedo boats Sqn in Toulon, where its boilers would be restored in 1914. She was in operations at the Dardanelles in 1915 and at Salonica in 1916. 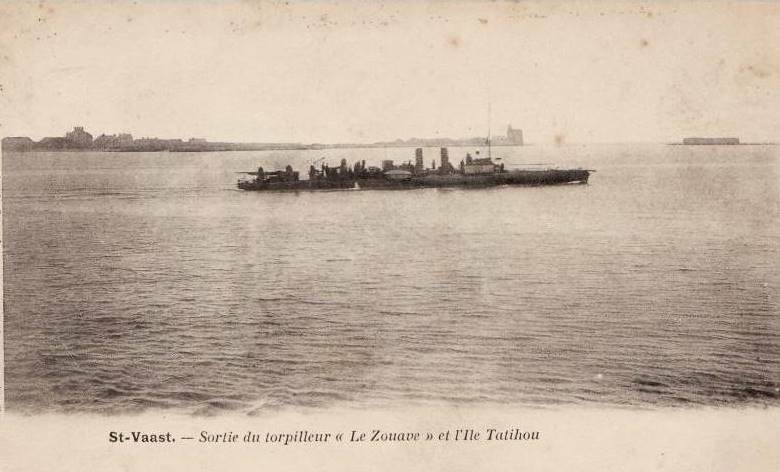 She was based at Bizerte, to the Patrol Division of Tunisia, from 1917 to 1919. Stricken in 1920, her hull was sold in June 1921. Just like in Germany, the need of greater range, armament, and command facilities for their use as squadron leaders, dictated the building of larger ships, called by lack of other worlds, torpedo boats for the high seas due to their greater tonnage. Their lineage eventually gave birth to the first French destroyers in the 1890s. Their larger size also allowed the use of turbines, helping them reaching better speeds while retaining a good range, all with better seaworthiness and heavier firepower. They had so many advantages over coastal TBs of the défense mobile it’s no wonder that they superseded them, from leaders to main classes. This class of nine ships were ordered from Normand, Claparède and St Nazaire (three each) on the basis of the torpedo boat Poti ordered by Russia by Normand and reluctantly gave to other builders by order of the ministry in 1884. There is no indication of their use as leaders, but just as an experiment for high seas TBs. For 58 tons and 40 m (1908′ 38 metre type had almost twice this tonnage !) they were considered too small and fragile for high seas and were relegated to coastal duties in 1890. They served until 1903-1913. These five ships were all ordered at Nantes, Loire shipyards. In fact the Ouragan was a private speculation, in the hope the Navy would adopt it, which happened. She was bough in september 1886 and tested, an order for four more following in December 1888. These were large ships compared to the previous De Lagrée, 177 tonnes at full load after modifications, 104 empty as designed. Moreover, despite using two loco boilers, they swapped to modern quadruple expansion steam engine, their power rising to 1400 ihp. This was not enough however to maintain a speed better than 19 knots, although the builder assured they could reach 23 knots. On trials the first approached 19.21 knots, but the four others did better. Trials went on for two years, and in between they received better boilers and their hull was strengthened. They were launched in 1887-89 but therefore operational in 1891, showing a three-masted rig (the foremast was later deleted). In 1897-99 they received again new boilers but despite of this were considered poor seaboats, only with the advantage of a 2000 nautic miles range and potent armament. The latter consisted in four single 14 in TTs (356 mm) mounted on each side abreast of the conning tower and aft, completed by two Hotchkiss Revolver guns. These three ships were a test design ordered from Thornycroft for their watertube boiler, boasting a very impressive power to weight ratio. These were almost identical to the Spanish Ariete, all in steel, with two rudder ahead and aft of the propellers, and achieved more than 23.6 knots on trials. two funnels, three masted rig, unusually roomy this 1888 prototype was followed by two French copies ordered at Graville in the Mediterranean launched in 1891 and 1892. They had heavier scantling, being poor seaboats. The first two were discarded and sold in 1910-12 an the third managed to survive as an auxiliary vessel until 1926. This was a Normand design of 1888 (launched 1889), and an enlarged version of the ‘126’ type. A pragmatic approach that made this serie reliable, robust and seaworthy, and also reasonably fast, 20.93 knots on trials for the lead ship. They had two funnels and a three-masted rig. However the Avant-garde was wercked on 25.2.1890 and a replacement was ordered and her parts were reused on the following Archer (launched 1893). The Navy, impressed, ordered two more from Loire NyD (Nantes) and three more from Normand, launched in 1891-92. The Normand boats reached 25 knots on trials, but the Loire boats were capped to 21, their designed speed. The class comprised the Archer, Turco, Zouave, Dragon, Grenadier and Lancier. There were differences between these. The first Normand pair, Avant-Garde and Archer were 128 tonnes fully loaded vs 127 for the Loire boats and 129 for the next three Normand. Size varied from 137′ 8” ro 138′, machinery also with Du temple TE or Loco CR, or Oriole, for 1250 ihp and 21.5, 1750 ihp for the others but diverging speeds because of their hull shape. 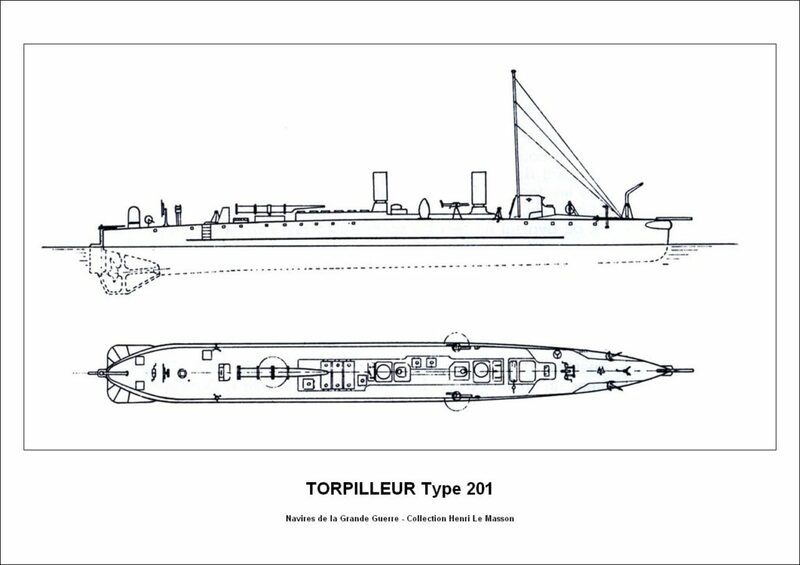 The torpedo tubes were two, one in the bow, one trainable at the rear, with 4 in reserve, while the Avant-Garde had a spar torpedo and two 14 in TTs. All were stricken before the war, but Grenadier went throughout, presumably as an auxiliary vessel. 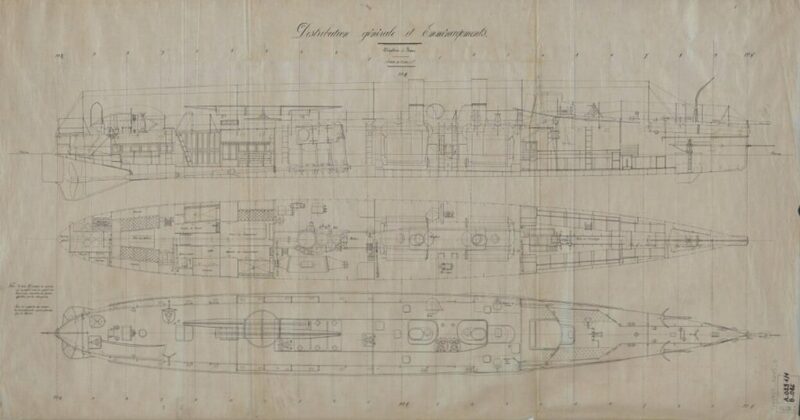 The director of La Seyne Yard (Mediterranean) submitted his own design to the ministry and a prototype pair was ordered in 3.8.1888. Not as fast as the Normand ships (perhaps 19 knots), but were still robust and economical steamers with their loco boiler, ensuring a better range (3000 nautical miles at 10.5 knots), and stable. This first pair had a single shaft, boiler and funnel, and two masts. 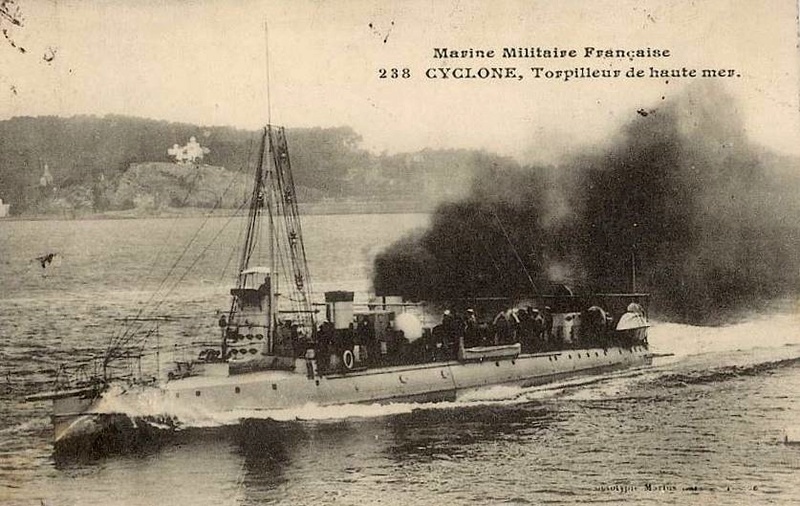 The following three (and the two Gironde’s boats) had heavier scantlings but also two watertube boilers, two funnels and reached 21.5 knots on trials. They had 2 thornycroft boilers, and Babillot (Gironde), for 1100 ihp and 20 knots, with a consumption of 14.5 tons of coal, for 35 tons total. All ships but the last three had three 14 in TTs (2 sides, 1 trainable?) or two 15 in TTs, one in the bow, fixed, one trainable at the rear. The class comprised the Agile, Audacieux, Eclare, Kabyle, orage, Sarrazin and Tourbillon. The Gironde boats had a diverging design and experience a lot of engine troubles, culminating with the Sarrazin explosion in 1894. Their Cail engines were deemed unreliable and their boilers were changed for Du temple models. Even then, they could barely reach 18 knots. These ships were no longer in service when WW1 broke out, Audacieux was sunk in a collision in 1896, the other were sold for scrap in 1908-1912 with the exception of Orage (1921). 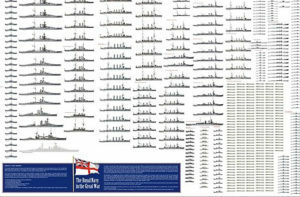 This serie comprises thirteen ships, all from different yards and on various designs submitted to the admiralty fo the FY1900 planned class. There were two “classes” of a couple of ships that has been integrated. Most of these designs had for purpose to test machine arrangements, boilers and half saw WW1, mostly for training and guarding duties. Corsaire: built at Loire, St denis (1892) near Paris, 168 tonnes FL, 50.50m long, with 2 shafts TE, Du temple boilers and 2500 ihp for 25.5 knots. She had two 15 in TTs, 4 torpedoes in reserve and two 37mm Revolvers. Bad steamer and poor seabot she was relegated to the défense mobile and BU in 1913. Mousquetaire: Built by Graville (Med) in 1892, 123 tonnes FL, 48m long, 2 shafts TE, 2 boilers Du temple and for the first time two 18 in TTs. 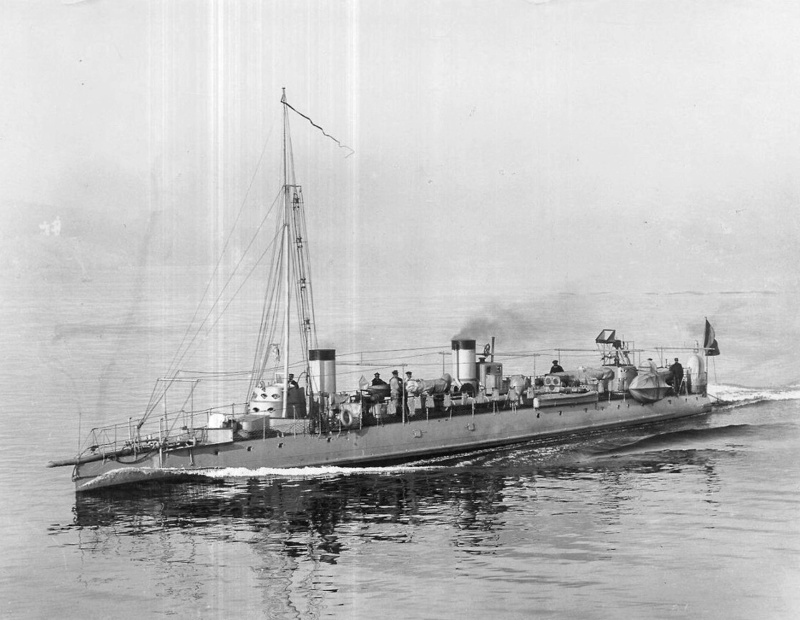 Initially she made bad trials, but her engine was revised by Normand. She was reasonably fast (24.5 knots), reliable and sturdy, good seaboat but not agile. Sold 1911. Chevalier: Normand built, launched 1893, 44 m long for 118/135 tonnes FL, she was the fastest of the three prototypes, 27.6 knots on trials, at that time a world record. Well-built, sturdy, agile and good seaboboat her TE enhine fed by Du Temple boilers gave 2200 ihp for little vibrations. She was reboilered again in 1902 and served through WW1 as a patrol boat. Lansquenet: An experimental TB fitted with Oriolle boilers, and built also by this company based in nantes, that previously had no experience in shipbuilding. She looked odd with a ram bow, three well-raked funnels, a turtle-like superstructure. She looked fast and the builder promised 26 knots but she did 24. Trials went on for seven years and her service from 1900 was shortened, as she was caught in a collision and was mothballed until 1905. Averne: Graville built two more TBs, heavily-inspired by Normand design of the Avant-garde class. She and the Dauphin were launched in 1893 and 1894, and made 25.4 knots on trials. 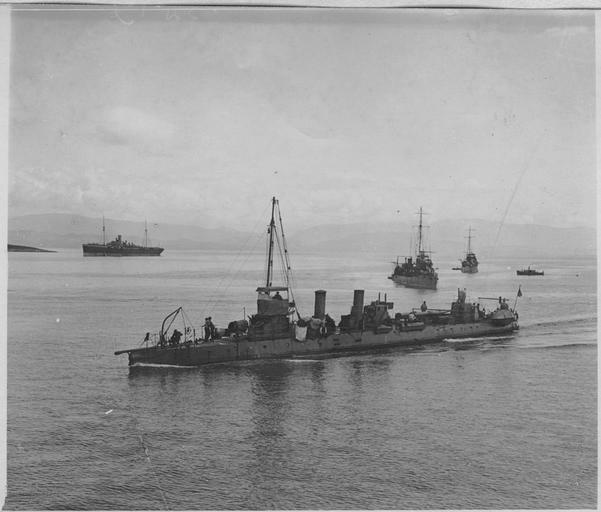 Both were good seaboats and Averne served in WW1. 113/131 tonnes, 43.85m long, but 15 in TTs and two 47 mm QF guns. Argonaute: Another pair of ships inspired by Normand’s Avant-Garde, this time from Loire Yards, Argonaute and Tourmente. 113/129 tonnes, 43 m long, 23.5 knots for 2000 ihp, and same armament as above. The were reboilered and received two rudders. Both were sold in 1910-11. Filibustier: A small group of three ships (also Ariel and Aquilon) ordered from Normand, which excelled once more. 123 tonnes, 42 m long, same armament as above, launched 1894-95. They ade 25 knots on trials, and served in WW1, although Filibustier was rammed and sunk by Friant in 1898 during a night exercize. 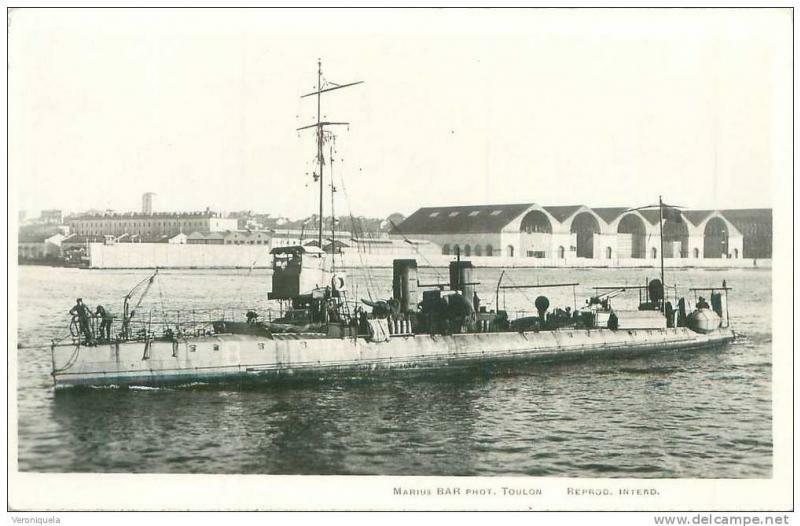 Forban: This was a large experimental ship from Normand (121/150 tonnes), 44 m long, with two Normand boilers which gave 3260 ihp for a top speed of 29 knots, even 31 knots in trials, another world record. She received 18 in TTs and attracted a lot of attention at that time. Mangini: An imporved Tourmente built by Loire yard, Nantes, she was named after the chief engineer that died in the Sarrazin accident. Launched 1896 she was considered a good seaboat, reaching 25 knots but able to sustain this speed for long. 127/140 tonnes, 45m long, 2x 15in TTs and two 37mm guns. She was sold in 1911. Five ships in two groups, Bourrasque, rafale (Normand) and Borée, tramontane (Gironde), plus the experimental Cyclone, all on a Normand design, based on the excellent Forban. They made 30.5 knots on trials, and their hull was tailor-built to reduce vibrations, with nickel-steel of lighter scantlings, and they possessed twice the range of the Forban at 2000 nautic miles @10 knots. Despite this, they were versed to the défense mobile, they served through WW1. Six ships all launched in 1901, built at Normand, Graville, and loire NYds. Normand design, based on the Cyclone, but introducing for the first time splinter armour, the first TBs to be properly armoured. An armoured box, 25mm thick in nickel-steel was built round their engine room. There wa also a 9mm thick deck. Normand at that time of tension with UK described it proof against British 6 and 12 pdrs. Of course this traduced in 18 net tons in weight taken, and therefore speed loss despite of the powerful engine delivering 4200 ihp. They all served actively in WW1 and were broken up in 1924-1928.